Vintage Norton Motorcycles: The ES2 – what’s in a name? The ES2 – what’s in a name? -SG- The ES2 conundrum has been rumbling on for years and we have had postings about it too (reproduced below). Perhaps, just perhaps, the answer has come to light, thanks to a 2016 letter to the Norton Owners' Club magazine. It reads: "During a recent conversation with a learned gentleman in Kent, the following came to light. He discovered in the records of a motorcycle dealer, Howards of Ramsgate, an invoice for the repair of an ES2 frame returned to the works in '48/'49. Norton's invoice itemised the frame repair as being for an 'EXTRA SPECIFICATION 2nd MODEL 18.' Unfortunately the invoice was lost with the closure of the business in the mid nineties." Bearing in mind this description came from the factory and not some imaginative journalist, it may indeed be correct. Draw your own conclusions! 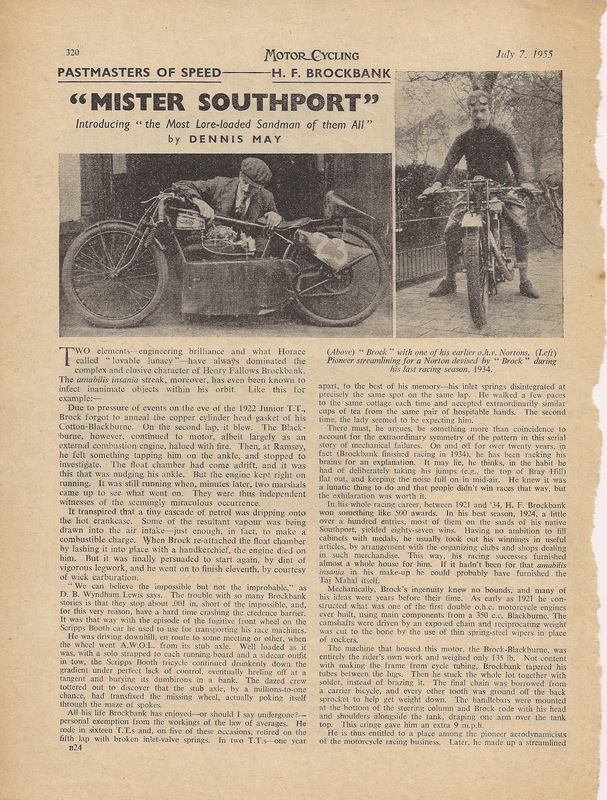 A: named as a tribute to Ernie Searle, the very successful Norton sprinter of the mid twenties who also rode – much less successfully – in the TT. B: named ES because the push rod return springs on the original (1928) production model were enclosed in thimbles, hence ES for Enclosed Spring and 2 because it was the second version, the first being the regular Model 18/19 etc OHV models on which these springs were exposed. This latter seems to have been the answer to the conundrum provided to Titch by Edgar Franks. On the grounds of commercial probability, I am inclined towards yet another possibility i.e. 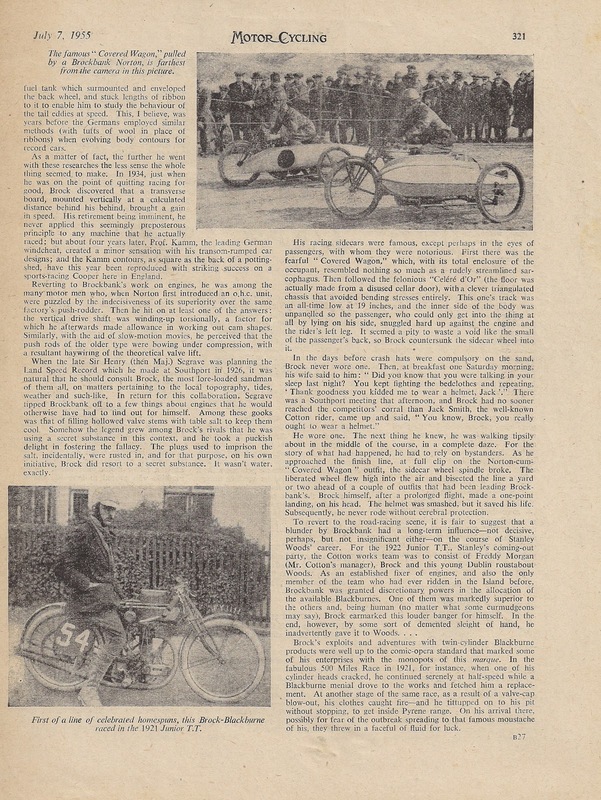 that ES stood for Extra Sports and the figure 2 was added because the CS1 was the first sports machine in the 1928 range. However, I guess Edgar Franks was in a position to know the real answer even though he did not work for Nortons until after the ES2 came on the scene. Reverting to the Ernie Searle option however, I was recently browsing in the final issue of Classic Motorcycling Legends (Number 34) and this reveals an interesting anecdote by Frank Farrington, also known as RADCO, well known author of many articles in various Classic motor cycle magazines as well as the excellent book ‘The Vintage Motorcyclists’ Workshop’ Frank – he sprinted and raced a very swift flat tanker in the sixties which I am glad to say is still in existence in other hands – lives in Lancashire and was personally acquainted with fellow Lancashire man H F Brockbank, in his day as well known as Searle and almost as successful. Read more about him in the attached Dennis May article (not as good as some of his others in the series). Anyway, it appears that ‘Brocky’, in a continuing search for yet more speed from his Model 18 based sprinter, hit on the idea of off-setting the head by a few degrees so that the inlet stub was angled to the right and the exhaust port, instead of being straight ahead, was angled to the left, with the exhaust pipe thus missing the front down tube, without needing a kink in it. This must have been a seriously major task from an engineering point of view but none the less, it was apparently done and Brocky gained a very few much needed BHP as a result. From various tuning articles I have read over the years, I would think the angled inlet port was the main contributor to this improvement. Ernie Searle and Brocky being friendly, Ernie learned of the head experiment and, such was his relationship with Nortons, it is suggested that Ernie asked for such a head to be cast by the works for his use. Frank goes on to put forward the idea that, perhaps, as a token of recognition of his input into the head shape, Nortons may have incorporated his initials in the new model designation of the ES2. Makes a good story but I am not really convinced! For one thing, the ES2 designation did not appear in Norton publicity until the run-up to the 1927 Show. 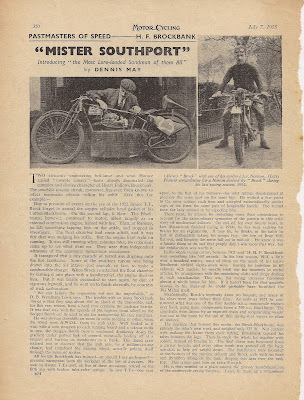 At the 1927 TT, it had no specific type number – it was just an OHV version of the exciting CS1 and received poor press coverage of its technical details, which I have attempted to unravel – hopefully I will find time to make another contribution on this subject later. For another, although the production versions of the ES2 head had a left hand angled exhaust port, the inlet stub was in line and not offset. It is basically an OHV version of the first CS1 heads. 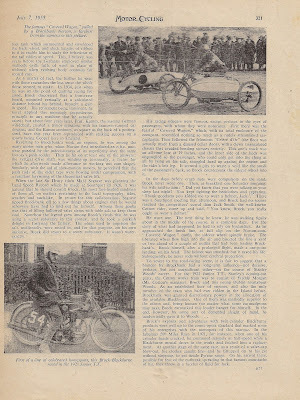 And finally, when Titch Allen went to interview Ernie Searle, the only reference made to heads was that he DID have a head specially made by Nortons but that it was simply to accommodate a larger exhaust valve diameter. No mention was made of special heads with angled inlet and exhaust ports, but, there again, perhaps Titch did not ask the right questions: at this stage, who knows? !